A team at Birmingham Magistrates’ Court is showing how cases can be heard digitally, in a test of what a magistrates’ court could look like in the future. From transferring money to downloading music, digital technologies are used in every part of our daily lives. But in the criminal justice system there is still a mountain of physical paperwork – every year the courts and Crown Prosecution Service (CPS) use roughly 160 million sheets of paper – expensive and risky transfers of offenders from prison to court, and a great deal of police time wasted waiting around in court itself. This isn’t an efficient use of resources, and takes frontline staff away from the duties that the public expect from them – preventing, prosecuting and punishing crime. Digital working is very much at the heart of the Ministry of Justice (MoJ) strategy for reforming the criminal justice system, which was published in June. Significant progress is already being made in modernising and digitising working practices in the criminal justice system. Police forces are transferring over 90 percent of case files electronically to the CPS, and all magistrates’ courts are now able to receive digital case files from the CPS. In some areas prosecutors are presenting 75 percent of cases electronically in court instead of using paper files. While a lot of work is going on to develop and test various digital solutions, they hadn’t been brought together as one package – until now. A team at Birmingham Magistrates’ Court has done just that in order to prototype the first digital court in the country. Individually the technologies being used in Birmingham will be familiar to us, such as video calling, the electronic presentation of information and Wi-Fi. However, the complexities of the justice system, the range of different agencies involved, the competing IT systems and the sensitive nature of the personal information being handled, together bring huge challenges when trying to implement an integrated digital solution. Michael Seath, Justices' Clerk for West Midlands & Warwickshire, is driving the project in Birmingham. He said: “The idea came from conversations across the criminal justice system. But we did not want only to have an idea; we needed something solid to show and test – to prove we could deliver a digital criminal courtroom. We know that this concept court is not necessarily the exact solution we will have in the future. But like a concept car at a car show, it demonstrates what we can do”. The use of secure video links, now available in 90 percent of magistrates’ courts and all crown courts, has been a simple solution that has uses across the criminal justice system. It allows defendants to appear in court from prison or police stations, reducing the expensive and risky transfer of offenders to court (roughly 13,500 prisoners are escorted to court across England and Wales each month, on average). For example, in a recent case at Westminster Magistrates’ Court, a man had been caught in possession of drugs and kept overnight in the police station. The magistrates were able to hear the whole case and issue the sentence in just a few minutes via video link directly from the police station, avoiding the significant time and cost associated with bringing him into court. 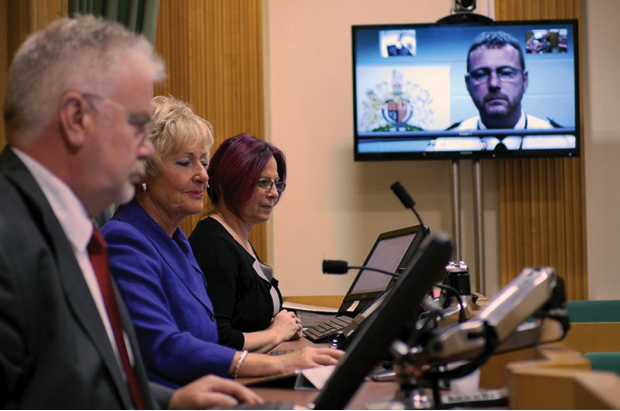 Video links also allow witnesses to give evidence in court without having to be physically present, both giving added protection to vulnerable people and also saving the time of police witnesses. To ensure the safe transfer of information to court, video links must meet Government security standards. The digital presentation of evidence from laptops or tablets onto screens in the courtroom has also delivered benefits and removed the need for sharing paper copies of evidence. Bindi Atwall, Senior Crown Prosecutor, explained a recent case in Birmingham where all the evidence was on closed-circuit television: “We requested the footage from the police; within two hours we had it in our hands and were able to play it in court. The defendant pleaded guilty on seeing the video evidence. Without the use of this technology, we never would have got it to court so quickly – it would have taken at least four weeks”. Making Wi-Fi available to court users has had a positive impact. It allows staff to continue working during necessary, but often frustrating, periods of downtime when waiting for evidence or when magistrates are considering cases. It also allows for real-time access to digital files and correspondence, negating the sort of delays associated with having to photocopy documents or leave the courtroom to retrieve information. Defence lawyer Steve Gelsthorpe has seen the advantages that it can bring: “I can access my case file from within the courtroom and I don’t have to bring to court piles of secure documents”. The safe transfer of information digitally was an important consideration and has been ensured through the use of secure email. Underpinning all of this is the use of digital case material. Material such as statements and evidence is passed to the CPS digitally by the police following a criminal act, and is used throughout the criminal justice system as the case progresses into court. The Government set out its plan to digitise the criminal justice system in its paper Swift and Sure Justice last summer. As a result, the Criminal Justice System Efficiency Programme has been testing digital working in Birmingham and six other ‘early adopter areas’ across England and Wales. Greta Band, Magistrates’ Bench Chairman, said: “People are using technology in all areas of life. We need to bring it into court and use it to speed up justice. Birmingham is the largest and busiest court in the country and this is a good place to trial the concept court – if it can work here it can work anywhere”. The digital court test successfully dealt with 80 cases, ranging from shoplifting to assault. As a result of the trial, there is now a commitment across Government to make the ‘digital courtroom’ a reality. Despite significant cuts in funding across Whitehall, MoJ has committed £160 million to make the criminal justice system digital by 2016, a programme being led by the Minister of State for Policing, Criminal Justice and Victims, Damien Green. Digital courts are a part of this ambition. The criminal justice system in this country is recognised the world over for being fair and just. The ambition of the MoJ is to transform it into one that is also respected for being swift, effective and modern. Not my field, but I feel enthused by this narrative on how justice (the process and so also the decisions?) can get better. Thanks - and may you suceed! My wife and I have a combined service of 36 years across multiple Criminal Justice agencies. I have lost count of the times we have been frustrated by slow, paper-bound processes and mis-matched IT systems. It is truly exciting to see these critical issues now being dealt with, not just theoretically or aspirationally, but also in practice. The groundbreaking work you are doing will be good for the victim, the offender, the lawyers, the judges and magistrates, the Probation Service, the police - and the taxpayer. The very best of luck to you in what may turn out to be one of the most significant advances in Criminal Justice history! "Thanks Stuart (and Richard for the previous comment) - we're extremely proud of our justice system but are under no illusions that improvements can be made. We want a system that works better for the people working within it and also for victims of crime. We're all very excited about the changes being made." It's good to see the positive comments above. The work going on to digitise the courts is one part (albeit a big part) of a wider push across the whole Criminal Justice System (CJS) to improve efficiency and deliver better services to the public by moving towards digital working. In addition to the work with the Courts and the Crown prosecution service, there is lots of work currently going on with the police to capture information and evidence digitally at the first possible opportunity, which will also have significant benefits for the CJS and the people who use it. Although this is very good news I am somewhat surprised by the length of time this technology has taken to roll out. I did post graduate research into the use of IT in criminal fraud investigation and electronic presentation of evidence back in 2003 and presented my dissertation to the then DTI. At that time about nine or ten Crown Courts were already geared up for EPE and video linking. One now hopes that the systems used by the various law enforcement bodies will all be compatible.